Paris attacks: A new type of terrorism? The scale of the near-simultaneous bombings and shootings in Paris has left France reeling in shock. With nearly 130 people dead, along with eight suicide bombers, it is Europe's worst terrorist attack since the 2004 Madrid train bombings. It raises new, pressing questions about the ability of Western security forces to prevent such random carnage. French President Francois Hollande called it an "act of war" organised by Islamic State (IS) militants. Why did this happen in Paris? Paris has been on heightened alert since the January terror attacks, when Islamist gunmen attacked the satirical magazine Charlie Hebdo, a policewoman and a Jewish supermarket, killing 17 people. Amedy Coulibaly, who killed four hostages in the supermarket before being shot dead by police, claimed to be acting in the name of IS. For many years some deprived housing estates in the suburbs of Paris and other cities have been fertile ground for Islamist extremists. Jihad has appeared seductive for some alienated young Muslims in areas of high unemployment and urban neglect. More than 500 French Muslims have gone to fight with jihadists in Syria and Iraq, experts say - more than from any other Western country. French warplanes have repeatedly attacked IS fighters in Syria and Iraq, as part of the US-led campaign against the group. What does the choice of targets suggest? They were soft civilian targets in Paris - the intention was evidently to kill many people randomly. The high-profile football match at the Stade de France was clearly a potential target. But the fact that three suicide bombers blew themselves up nearby at three eating places was unusual. France has not experienced such near-simultaneous bombings before. Then the attack on Bataclan concert hall - again by suicide bombers - was also designed to kill ordinary young French people having fun on a Friday night. It happened during a rock concert. More than 80 rock fans died in the mayhem. Some French commentators recalled the Moscow theatre siege of 2002, when Chechen militants stormed a live show. The attack and bungled Russian rescue left 130 hostages and 40 militants dead. 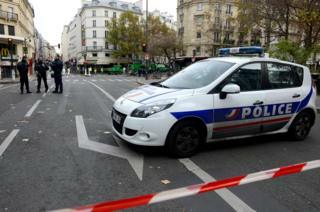 French journalist Agnes Poirier told the BBC that the 13 November bombers struck at "modest, working-class neighbourhoods, not tourist sites" in Paris. The 10th and 11th districts (arrondissements) are "very diverse - that makes it more poignant for the French", she said. Claiming responsibility for the carnage in Paris, IS said it was a "capital of abomination and perversion". It called the concert-goers "pagans". Shashank Joshi, a security policy expert at London's Royal United Services Institute, said there was clearly a "cultural" aspect to the choice of targets. "It was a deliberate choice of leisure venues - where people relax," he told the BBC. The bombers went for crowded places, portrayed by IS as immoral, he said. Was this like previous terror attacks in cities? According to Mr Joshi, the closest parallel is the Mumbai (Bombay) attack of 2008, carried out by Pakistan-based Islamist militants. They brought terror to the streets of Mumbai, staging simultaneous gun and bomb attacks across the city. In Europe, the Paris carnage has reminded people of the devastating train bombings in Madrid (2004) and London (2005), which were also carried out by Islamist militants. Jews were targeted in some previous Islamist terror attacks - in Paris in January, in the attack on the Brussels Jewish Museum in 2014, and in the 2012 shootings by Toulouse gunman Mohamed Merah. He killed a rabbi and three small children at a Jewish school. Anti-Semitic attacks by jihadists are often linked to Arab hostility towards Israel. This new atrocity in Paris shows that the militants "have no single priority or hierarchy" when choosing targets, Mr Joshi said. Pieter Van Ostaeyen, a Belgian expert on jihadist groups, said IS appeared to be "signalling that it can attack anytime, anywhere, and we cannot prevent it". It was highly coordinated and probably took months of training, he told the BBC. There have been similar suicide attacks in Syria and Iraq, where militants have used up all their bullets, then blown themselves up in a crowd, he said. But never before in France. But Mr Joshi said these were not necessarily Middle East war veterans, or weapons experts. "They were prepared, yes, but they have not proven a high level of marksmanship - their preparation may have been quite basic." Was it a French security blunder? Neither Mr Joshi nor Mr Van Ostaeyen thinks so. "You can't guard all soft targets," Mr Joshi said. "It's more about responding to events, having communications between the arms of the state, strong leadership, controlling the flow of information, to minimise panic." According to Mr Van Ostaeyen: "France has done everything it could do... it's too early to say they could have prevented it". A key question is whether IS managed to organise the attacks from outside France, or whether it was local French Islamists inspired by IS.